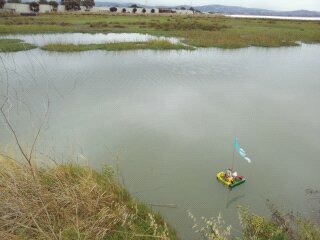 A King Tide came our way last week, giving us a glorious opportunity to launch a ceremonial tule reed boat at the edge of San Francisco Bay. Because of the drought we’re experiencing, it had special meaning, bringing with it a sharpened awareness of global warming and the life style changes immanent and necessary, and a deep appreciation for all the ways that water is present in our lives. This lovely cere mony came from my travels over 25 years ago to Lake Titicaca, between Peru and Bolivia. 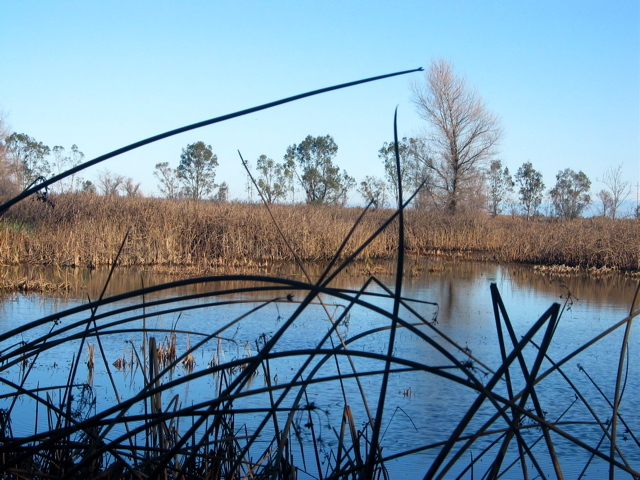 Tule reeds are not new here to the Bay Area. For hundreds of years they lined much of San Francisco Bay; ignorant of the important role they play in bringing oxygen and in cleansing toxins, over decades most of the reeds were cut down. Now only isolated pockets of them still exist. When they’re harvested for the boat, we ask permission of the plants themselves, explaining that we want to honor them with ceremony, and want to center ourselves in gratitude and respect for the life forms that are part of the ongoing web of life here at the edge of the Bay – the plants, the fish and other water creatures, the birds shorebirds and those who pass through on the Pacific Flyway, the human beings who are drawn to this special place of beauty and power. With reeds gathered several weeks in advance, a group came together near the Bay’s shore; we did a ceremonial cleansing of the reeds and our intentions with them. Using raffia to tie them, bundling 15 or so reeds together, we assembled 3 bundles for the base of the boat. Two bundles on each side created a “container ship”, about a yard long. We sang water songs, told traditional water stories and personal experiences of water adventures, feasted on fishy things and other treats. Several ears of ceremonial corn were placed in the boat for struts, widening the container so that other biodegradable offerings would fit into it. 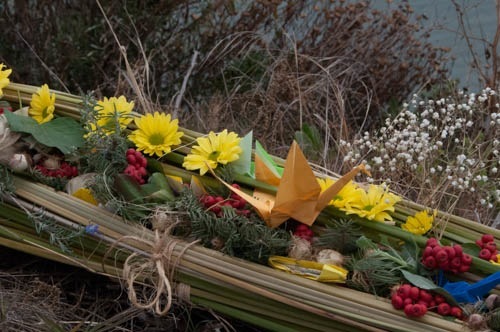 Corn meal, herbs, beautiful flower petals made a wonderful bed for origami boats and birds. We added personal offerings – gratitude for water’s presence, commitments to living in harmony with water’s moods and needs, and intentions to celebrate with poems, stories, songs, dance, drumming – being more conscious of this wonderful gift, and not taking it for granted! Taking the boat to the shoreline, we reveled in the huge swell of water filling the channel – dallied while we watched it reach its peak, telling more stories of water adventures. Barbara sang a wonderful Lakota song, and when the water turned to go back toward the Bay, Roy and Eric got down on their bellies, and launched the boat on the outgoing tide. That day, the rains began – at first a few days of dribbles. Now a week has passed, and the rain sporadically continues, with another storm on its way. The agonizing weeks of no rain here were an important wake-up, and we have a chance to shape our water habits with greater appreciation for its marvelous and necessary presence in our lives. The list below has the titles of a number of stories and songs. It would be fun to include movies related to water – and if you can add other watery songs and stories, that could extend this source. Keep tuned for other water events. What have we done to the rain? On Friday of this week, some profound cleaning may begin at Fukishima, when workers start the removal of spent and dangerous fuel rods from their holding pools. Here’s a meaningful way to be connected – a process passed along by the Andean Shaman Americo Yabar, over 20 years ago. This was part of Circling the Bay day on San Bruno last weekend, walking next to a frog restoration site – a great place to be, as we spoke of the important work at Fukishima this week. It’s one Circling the Bay has done at Ring Mountain, standing looking out at San Quentin. This may remind you of a practice you already have in your “tool kit” – or may inspire you to create another way of relating to the intensity of planetary changes. If so, please share what comes to you. We are all connected, and the tides twice daily remind us of that. 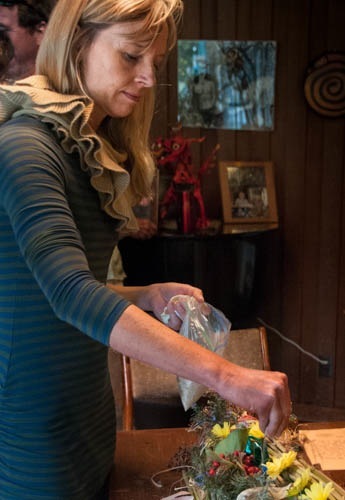 As Fukushima clean-up intensifies in dealing with spent fuel rods, here’s a walking meditation, a personal cleansing and healing that can connect you with the actions of transformation. It’s a useful way to participate meaningfully in this time of profound planetary change. 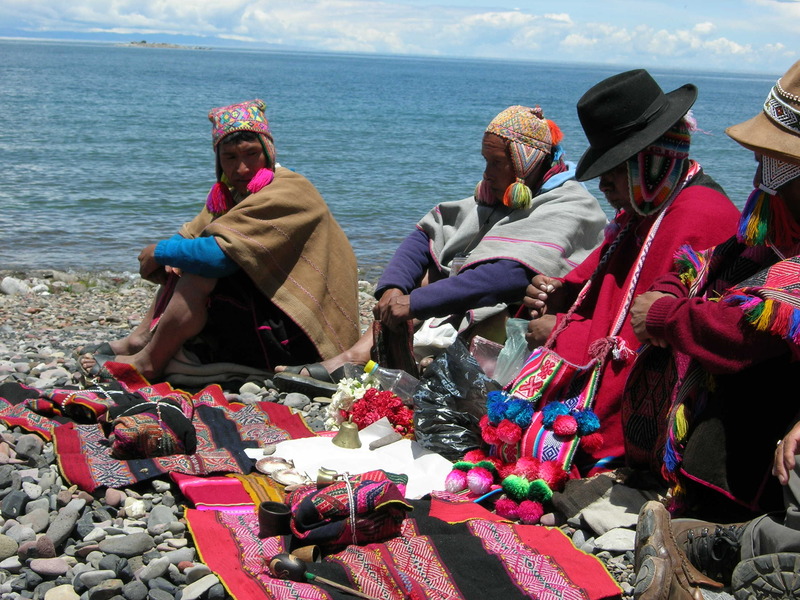 The people of the Andes call this time on the planet Pachacuti – the time of great change. This meditation, called Eating Hucha, can surprise you in its potential to transform anxieties and fears about the situation.Hucha is heavy or dense energy – our anxieties, fears, anger, depression – you know the kind. Wherever you’ve chosen to be, stand still for a few moments, and look around you, taking in the beauty that surrounds you –being aware of the lay of the land, of the wind blowing through the leaves of trees, plants dotting the landscape, clouds scudding across the sky. Spread your arms wide as you inhale, opening them to receive a huge gift inhale (as you ARE – the breath of life!!). Tip your head back, so that you’re opening your heart cavity from the sides and from above. As you exhale, bring your hands to your heart and take in the beauty around you. Fill your heart, your whole being, with peacefulness, with the pleasures of sound, fragrance, and sight that encompass you here. Do that several times, until you feel fully aware of, and quite filled with, nature’s beauty. Sit comfortably, or if you prefer, begin to walk slowly. Imagine a mouth in your belly – see the lips, the teeth, the tongue. Notice whether the lips are full or narrow, whether the teeth are perfect or a little askew. Focus on any feeling of anxiety in your personal life. Let those feelings surface that keep you from being as peaceful as you’d like to be. Don’t identify with the feelings – just name them, let them come to the surface. Now focus on the mouth in your belly, and imagine eating those feelings – watch the lips close around them, the teeth chew them up, and the tongue and throat carry them down a pipeline like your twisting and turning intestines, directly into the earth. Our feelings, like everything else, are a form of energy. Mother Earth has a composting habit that feeds on what we provide, and is quite able to accept as food the heavy energy of your thoughts and feelings. These feelings represent food to be recycled. These feelings become offerings of compost; leave that anxiety to become compost for the living plants around you. Chew up your sadness and pain, your anxiety, your frustration, without identifying with those feelings. Take those feelings down imaginary strands that reach from that mouth, through the muscles of your body, and into the earth. Use your breath to help this process – inhale as you take in the heavy feelings, exhale as you send them on their way. When you feel complete, take a few more deep breaths, filling yourself with the life force around you – the living, breathing expressions of the life force pulsing in all its forms. Then allow yourself to tune into your feelings about Fukushima – the anxiety that’s hard to focus on, the sadness about the damage to the Earth, the fear and displacement of so many people, the apprehension about far-reaching impacts of contamination. Images from the news and words you’ve read, dialogues with friends, may have fed these heavy thoughts. Left in our hearts and minds, they keep us from being able to align with peace, with beauty; but we become part of the process of creating peace as we make way to allow other perceptions, other visions, other possibilities to replace that heaviness. Circling back to the beginning, take in the beauty that surrounds you. Letting go of the heaviness that occupied you, you now have space that can be filled with light, with beauty – with feelings of compassion and participation in a vast community of living beings, some human, some not. You may find yourself able to receive with more depth, and a greater sense of peace. If you’re near water, be particularly mindful of its beauty, its part in the well-being of our bodies, of all things alive and growing, of its capacity to connect us with the waters of the world. Notice and enjoy your connection to the Earth, and to the waters. Send your highest anticipation for the success of the steps being taken at Fukushima. We are connected. We can care for our waters with appreciation, and with the actions of our lives. 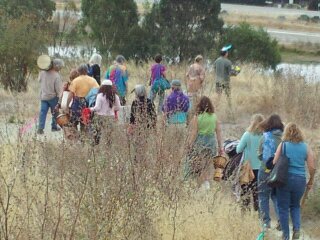 Drummers and banners dotted the pathway leading to the hillside overlooking Redwood City’s salt ponds, where we gathered around a cheerful hand-made boat destined to be part of the ceremony. We’d come to reclaim a vision of the wetlands once present here, a vision for the same kind of transformation that has succeeded in restoring thousands of acres of wetlands along the shore of the Bay. 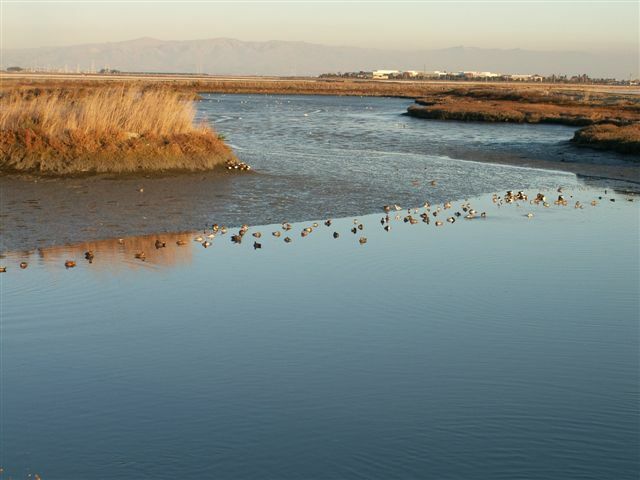 Sites in Newark, in Alviso, in Petaluma and elsewhere form a necklace of wetlands, affording habitat for migrating birds and other wetlands life forms. Human beings, too, enjoy canoeing, walking, birding, kite flying at those sites. 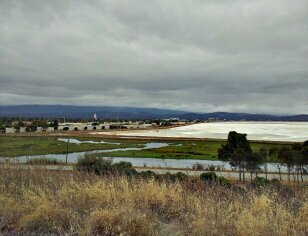 Looking northwest, the hibernating wetlands sparkled with bright white salt; what some have called a wasteland can emerge as it has elsewhere along the Bay, and life WILL return. 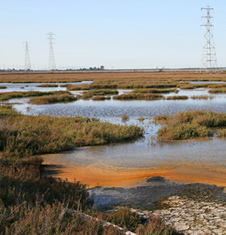 Salt ponds that Cargill sold in 2002 became a place of refuge as the levees were breached, and the mud of the bay brought with it the seeds of returning life. Now, when you canoe along the shoreline, cat-tails and tules rustle overhead; hidden nesting sites bustle with activity and melody. It’s a visible a visible reminder that people with strong intention and deep caring have the power and the pleasure to return balance to the life we share with all beings. Helplessness gives way to hope that we can make a difference. How do we begin? We tap into the deep will to survive that exists in all creatures. The will to live is everywhere around us, and all of nature takes part in the invitation to procreate. Nature weaves a beautiful design, one life form calling to another to sustain life on earth. We’ve come to take part in that intricate dance of life. Our songs, our open hearts, our dancing feet are part of the seduction we’re extending to life returning. We welcome the lives that have long shared the wetlands at the edge of the Bay near Redwood City; we begin to dissolve the barriers to life returning. We’ve come to restore and take part in the web of life. We’re here to honor and celebrate the plant people, the fish people, the animal and bird people, welcome their return to their homes in wetlands, where Earth and Water intertwine, where the water surges toward the shore, and returns to the Ocean. We honored first the elemental powers that sustain all life – calling on air, fire, water, and earth. Susie reminded us of the Bay’s beginning. 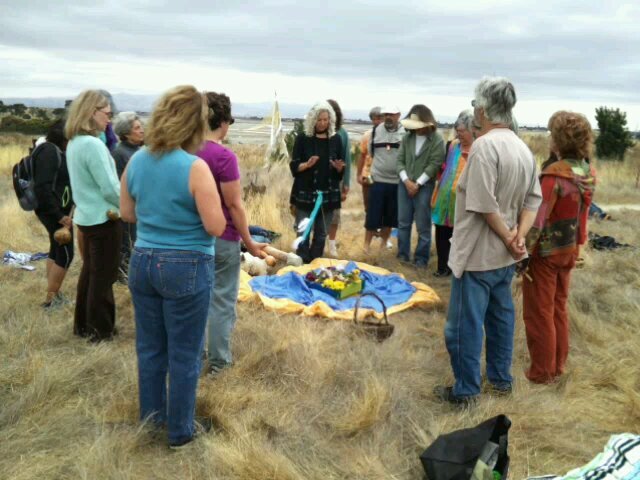 Cynthia shared a traditional blessing of the land. Inspired by a traditional Haida story of raven discovering the first people emerging from a clam shell, Carol created a story of life emerging in the complexity of cultures coming together at the edge of San Francisco Bay. Taking up rattles, we joined the drumming of Eric, Jonathan, Penny, and Patter in waking the earth, heard Herb’s delicate flute calling the birds. We began to envision a restored wetlands. Singing out our invitations to the birds, the fish, the animals, to the muddy waters full of seeds and pregnant with new life, we danced, our feet waking the earth and opening our hearts. Weaving the songs of life, we let them intertwine, just as they will be involved with one another when they return. We gravitated toward the small gaily decorated wicker boat in the center of our circle, and filled it with welcoming feasts from the natural world. 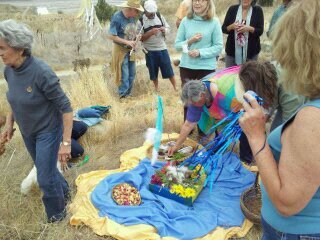 Maya blessed the boat; Robin reminded us of the pond salt dissolving as we placed small fragments among the offerings. Walking toward the shore, Peggy and Holly led songs honoring the earth and the water; Eric carried the boat to the water’s edge, and we sent our invitations to the waiting World of Spirit. Over the next months, we’ll be engaging with life at the wetlands that have already been restored – canoeing, birding, using magnifying glasses and walking on paths along the water. We’ll be renewing relationships with the gifts of life on the edge. We’ll re-member our places in the web of life – filling our eyes and hearts with beauty, pleasure, compassion and care for the fragile existence of which we are a part. Doing this, we’ll prepare the way for the return of these precious life forms to the Redwood City wetlands area. Our own capacity to envision the renewal of their habitat will offer them a filament of light to travel back to their homes here. Enjoy your sense experiences at the edges of the Bay to expand your vision of the Redwood City Wetlands returning. Dream it. Bring it about. One of the gifts in preparation for the Wetlands Ceremony was spending time each day at Bayfront Park. Before dawn on the Fall Equinox, Carol and I went to the spot where the Ceremony was scheduled to take place. We sat on a hillside next to Redwood City’s Salt Ponds sparkling in sunlight below us. We sat in the tall grasses, facing the East. In the foreground, a long, wide channel of water running east and west cut through a salt pond, so that when the sun peeped over the mountains in the distance, a “second sun” appeared reflected in the channel; the higher the sun in the sky, the more the sun in the water moved toward us. The double image was simply beautiful- and then, before long a third “sun” was reflected in the Bay itself, between the one on the channel and the one in the sky. I think you’d have to be on another planet somewhere else in the universe to see three suns at the same time! transparent that the sun show through the delicately striped, leaf-like structures on the plants, and it was beautiful, beyond belief. Other tall grasses had less transparent structures, but beautiful shapes all turned golden from the sun. A tiny snail was clinging to a stem, and its concentric circled shell was glistening, with its whirls of white, blue, grey, and tan all just singing! The Wetlands series has been flowing along with wonderful mini-events, and will culminate with a ceremony this Sunday, Sept. 25, 11:00 AM at Bayfront Park in Menlo Park. It’s a community project to re-imagine what the Redwood City wetlands might be if returned to their natural state. The most recent addition to the necklace of restored wetlands around San Francisco Bay took place a week ago, when Chronicle Staff writer Carolyn Jones reported that the waters from the old Alameda Creek flowed into the “bone-dry moonscape” of a salt flat for the first time since the 1850’s. The 630 acres will eventually be connected directly to San Francisco Bay. It could be Redwood City’s turn next! 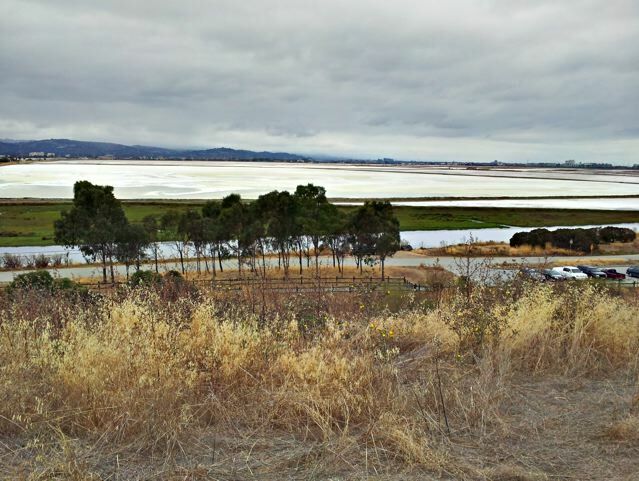 The dialogue about the Cargill Saltworks project building homes for over 30,000 people on the 1400 acres of salt ponds has helped point up the potential for this important part of the Bay’s edge to become reconnected to the Bay. Similar projects include the most recent addition of Alameda Creek. (Take a peek at the great mapping of these projects on www.virtualsaltworks.org) USGS has produced a film about salt marsh restoration,, and the Redwood City salt ponds have already been acknowledged as appropriate to become part of the Don Edwards National Wildlife Refuge. So we’ve begun to re-imagine its future with that in mind and heart. 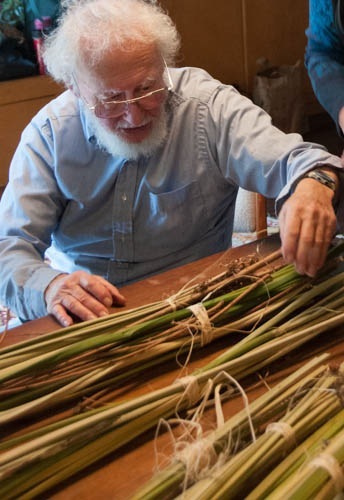 You might want to visit some of the restored areas – for example, walk or canoe at Alivso, where the tall reeds of cattails and tules tower over your head, and help you envision a time not so long ago when these plants were crucial to the daily lives of the Ohlone people. Several weeks ago, we began that visioning with an evening of rattling and singing, letting songs emerge that would honor and greet the long-gone birds, plants, and animals who make their homes in other nearby wetlands. It was a magical evening – and we followed it with a more mundane visit to the area in question, next to Seaport Blvd. Later, we scoped out a crest of land at nearby Bayfront Park; at this vista, which overlooks several areas of salt flats, we’ll do our visioning ceremony this Sunday, Sept. 25. A week later, Eric DuPraw guided us in making rainsticks; their sound of falling rain can inspire our visions of water at Sunday’s ceremony. And finally, last Sunday Robin Mankey, doll-maker and teacher of body tales, led us in creating images of good habitat for the wildlife we look forward to hosting. You’re invited to join us at Bayfront Park, creating ceremony to welcome the restoration of the salt ponds to wetlands. At the park, you can walk among tall grasses that rustle in the wind, hear the birds who call to one another, see the vistas of the area that can become the restored wetlands. This return to natural habitat can offer a ray of hope for the future of our children, reminding us and reassuring the next generation that all of nature has not been abandoned. Hear drumming, and stories of water; listen to spirited chants that members of the community have created to reflect he nature of these wetlands features. Come celebrate the wild beauty that is right in our own backyard. You’re invited to bring children, rattles, and something to sit on.